Sims Park in New Port Richey, first known as "Enchantment Park" when it was established in the early 1900's, is a thriving community park in the downtown area. The park and the area around it - including Orange Lake and the Hacienda Hotel building - are steeped in history ... being a thriving destination for movie stars, sports personalities, and politicians since the time New Port Richey was established in 1911. In addition to the obvious features of Sims Park, like the river walk and outdoor bandshell and concert stage, one of the most popular attractions has been a "super playground". A large wooden playground was constructed by volunteers in 1990, and became a destination for families from near and far. As the years rolled by, and the wooden playground began to deteriorate, the City of New Port Richey developed a plan to replace the playground as part of a complete multi-million dollar renovation of the park. In 2016 the new renovations were completed. After the renovations, the playground area continues to be a centerpiece - now including a separate area for toddlers, a splash pad, and an outdoor fitness area. Roads were rerouted so that Orange Lake, the West Pasco Historical Society museum, and the Peace Hall historic church building would be an integral part of the park area. Two floating docks - one with a handicap accessible kayak launch, are available for public use along the river. A covered picnic shelter, and numerous benches throughout the park and along the river walk, make it a popular and relaxing place for a stroll or get-together. Dogs on a leash are permitted. 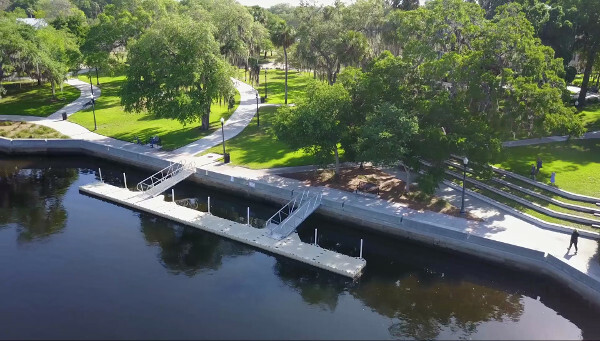 In addition to its daily use as a community park, Sims Park is an integral part of many annual celebrations and festivals - like the Chasco Fiesta, Cotee River Seafest and Boat Show, the Cotee River Bike Fest, and the River Lights Boat Parade.